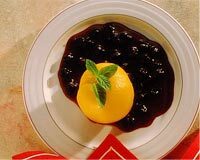 Blueberry Sauce is a very popular recipe. Learn how to make/prepare Blueberry Sauce by following this easy recipe. Put fresh blueberries and lemon juice in a blender. Blend the mixture. Add sugar and lemon zest into the mixture. Transfer the mixture into a saucepan and heat it on medium flame. Serve the sauce with blueberry scones.